Little Thumbs Up : Baking and Cooking event, selected ingredient for the month of May is "MUSHROOMS"
Little Thumbs Up, is an event organized by Zoe from Bake For Happy Kids and Doreen from my little favourite D.I.Y. , where an ingredient is selected each month and everyone is welcome to join in by using the selected ingredient either in your bakes or in your cooking pot. I am the host for this month, and my selected ingredient is "MUSHROOMS". Please do join us, cook or bake any recipes using Mushrooms as one of its ingredient, post it in your blog within this month, (only new and current posts), and link to Little Thumbs Up, in the thumbnail linky which is provided at the bottom of this post. 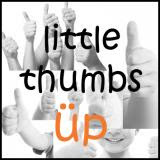 To find out more details on Little Thumbs Up, please click here. While this month's theme is MAY : MUSHROOMS, the selected ingredient for June is Curry Powder or Paste and will be hosted by Everybody Eats Well In Flanders. Cook or bake any of your favourite curry dish, and link that up in June which shall start on 4th June. Portabella is the largest of the cultivated mushrooms. They have tan or brown caps and measure up to 6 inches in diameter. These mushrooms have deep, meat-like texture and flavour. Portabella can be grilled, broiled, and roasted and they make a flavourful vegetarian alternatives and are great served as "burgers" on toasted buns. On the nutrition side, one medium cap provides 22 calories, 0 gram fat, 4 grams of carbohydrates and is an excellent source of B vitamin riboflavin, a good source of the antioxidant selenium, potassium, phosphorus, the B vitamins niacin and pantothenic acid and copper. Let's get down to the recipe for today : Portobello Pizzas. I made these Portobello Pizzas for the kids' after school lunch, and boy, do these bring out those smiles! I am a fan of Rachel Ray! I have tried many of her recipes and so far they have not disappoint me yet, including this Portobello Pizzas. These are downright delicious! 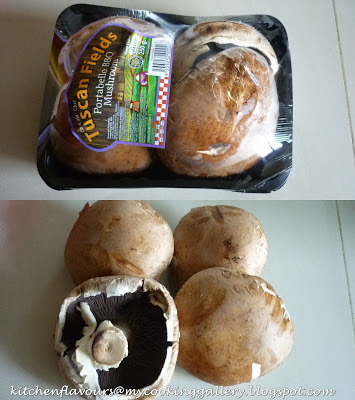 Firstly, remove the stems and scraped out the gills from the Portobello caps. Wash them gently under running water to remove any dirts. Dab them dry gently with some paper towels. Place them on a greased baking tray and season with a sprinkling of salt and black pepper on both sides. Drizzle some olive oil over and broil in the oven, caps side up for about 2-3 minutes, turn over and broil other side for another 2-3 minutes or until tender, watch out that they do not burn. Remove and stuff with filling. The recipe uses Italian sweet sausage. I use my own homemade Italian sweet sausage, will share the recipe on another day. The filling is made up of the sausage, cherry tomatoes which are cooked until they burst, a delightful process to watch when the cherry tomatoes popped! The mushroom caps are stuffed with the filling, top with some cheese, here I have used mozzarella cheese. Grill these mushrooms under the broiler for about 1-2 minutes until the cheese melts, keep a close watch, taking care not to burnt the cheese. I'm linking this post to Little Thumbs Up event, hosted by Joyce, kitchen flavours, organized by Zoe from Bake For Happy Kids and Doreen for my little favourite D.I.Y. To join us, simply bake or cook any recipes using the ingredient for this month MUSHROOM. Submit your post by linking to the thumbnail linky provided at the bottom of this post. Your submission must be a current and new post. Mention Little Thumbs Up in your post, and submit your post to the thumbnail linky to the host of this month, Joyce from kitchen flavours, and link to Bake For Happy Kids, and my little favourite D.I.Y. Feel free to display Little Thumbs Up badge in your post. Last date of linking will be on 31st May 2013. Dress the mushroom caps with liberal drizzle of extra-virgin olive oil and season with salt and pepper. Broil the portobello mushrooms 5 minutes on each side until tender. While caps are broiling, heat 1 tablespoon extra-virgin oil in a skillet over medium high heat, add sausage and brown and crumble the meat. Then add tomatoes to the skillet and cook another few minutes until they burst. Add cream to skillet and reduce 2 to 3 minutes more. Remove the sausage from heat and fold in basil. Fill mushroom caps and top with cheese, place under broiler to brown 2 to 3 minutes, then quarter caps and serve. Good morning, Joyce! This is certainly the best way to cook mushroom! Love you made your "pizza" with these mushrooms instead of the pastry! I've one mushroom recipe which is going to try so please bear with me as I still haven't taken action yet. Must do it this month, I promise to show my support to you! Love to see so many recipes which have been posted for this month's of LTU! Oh wow, these portabella pizzas look so delicious! I've always liked portabella mushrooms baked this way. I love all kind of mushrooms and pizza, haha! Yum。。Yum， I love this pizza ! Hi Joyce! I had cooked some mushroom dish to participate in your event! Let me sort out my pics first! The pictures says it all, it sure looks very yummy. The past few days I did some cooking using some white buttons too (going reasonable price now in NZ) and I really want to participate for the mushrooms month....Im just too tight up with other activities here with my family so just unable to take photo of my cooking. You are supposed to be on holiday! Haha! No worries if you cannot join in! I hope that you are having a good and enjoyable time in NZ! Today the weather is unbearably hot, the temp from this morning to evening was 34C, now is 30C and it is already 10pm! Enjoy the cool weather over there, you will miss it when you come back home to Malaysia! What a creative pizza idea! Looks really delicious! Another very expensive type of mushroom but they are so delicious! My boys would surely love this dish very much as it has all their favorite ingredients in it! Lovely. just bought a pack of portobellos too for this month's 'Mushrooms' event. Wooh, portobello... just came back from the Philippines and there is a dive shop there with the same name... anyway, mouth watering dishes! Hi Joyce, Very creative and looks awesome! Joyce , I'm still thinking re dish with mushroom :P :D Maybe another stir fry dish ? Your portobello pizza look appetizing . Delicious indeed ! These looks so delicious and I am very interested to see your recipe for homemade sausages. Joyce, you are making me hungry! Those portobello pizzas sure look yummy. I love portobellos and usually use them in omelettes. I am full of mushrooms this month hah! hah! What a nice idea to fill this huge mushrooms with pizza ingredients...they look gorgeous and very flavorful. pizza in a mushroom? that's pretty brilliant! also made your own sausages?? wa lau eh! !